Day 1 WHY STUDY HISTORY? · To learn from mistakes and successes of past generations. We followed this up with a short discussion on cultural differences that caused such tragedies as the Holocaust, the Tutsi versus Hutu conflict in the 1990’s and most recently 9/11, and analyzed what can be learned from these events. We finished with an examination of historically significant events that upon being witnessed have a lasting impact on the observer. We focussed on the social impact of hockey defining Canada within the international scene. We looked at Paul Henderson’s game winning goal in the 1972 Summit Series versus the Soviet Union (my dad's generation), followed in my generation by Mario Lemieux’s game winning goal versus the Russians to win the Canada Cup in 1987 and finally my son's generation in which Sydney Crosby scored the decisive goal in the 2010 Winter Olympics in Vancouver versus the U.S.A. These three events not only allow Canadians to feel a sense of nationalistic pride over different decades, but also demonstrate how important history can be when “shaping a nation”. Students were assigned a title page to complete based on the theme "Shaping the Nation". 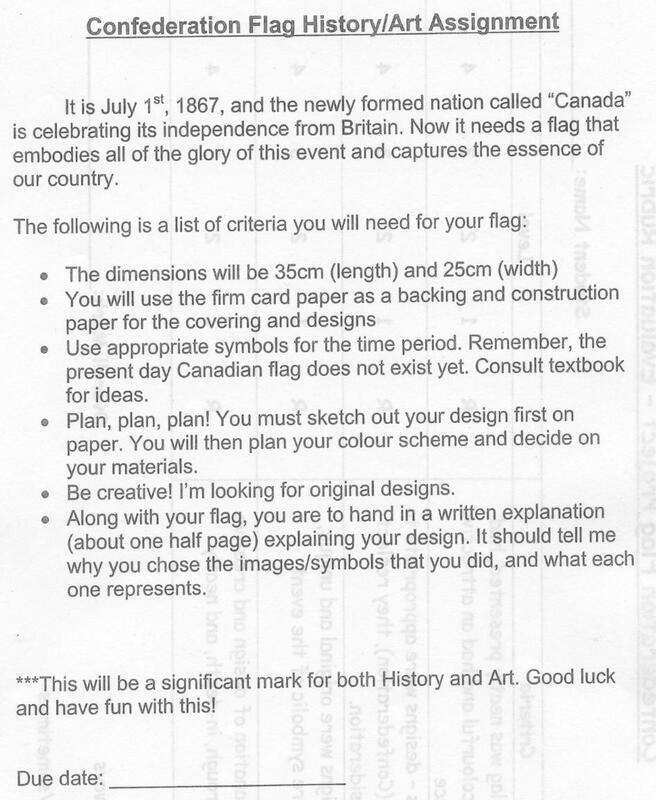 For ideas about what images to include on the title page refer to pages 54-121 of the Canada Through Time textbook. 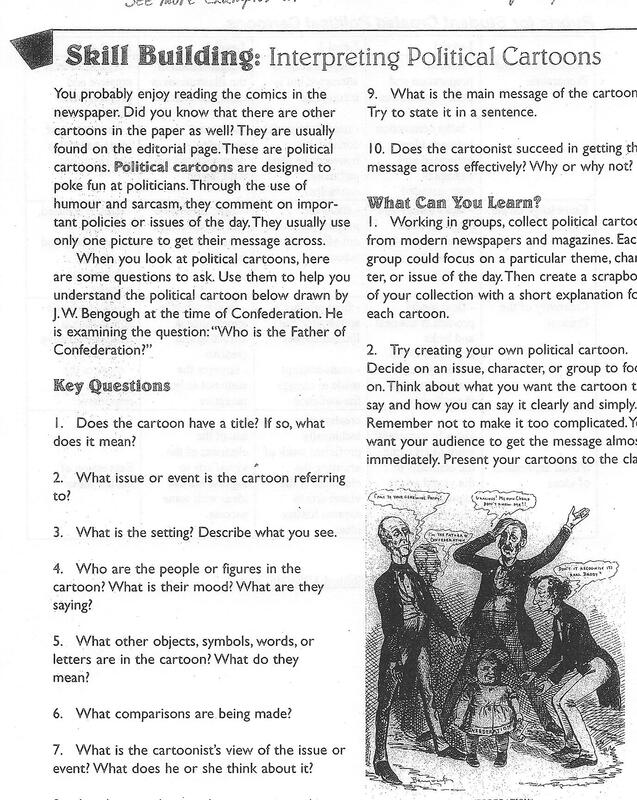 (B) The students will then be asked to spend time familiarizing themselves with and defining key vocabulary that will assist them throughout this unit. Due Sept.
(C) As well, the students will complete a mapping project that will enable them to understand the differences in the layout of BNA compared to present day Canada. Today the students are asked to examine life during the 1850's in each of the main regions of BNA and create a graphic organizer that summarizes the main features of life at the time. 3. The West the large, mostly empty expanse of western BNA which now consists of the prairie provinces and British Columbia. The entire documentary below is excellent, however focus on the part from 25 minutes to 30 minutes where the cable is laid and finally reaches Newfoundland. It shows how arduous the task was and how much celebration there was around the world that the feat was accomplished. Unfortunately, this first transatlantic cable (1858) failed after the initial success, but it did prove that it was possible. By 1866, the technology had improved to the point that the messages could be sent almost ten times faster than the initial cable of 1858. The following weblink provides a good general overview of the major incidences, outcomes and personalities involved in both the Underground Railroad and the American Civil War. It also provides fanatastic links to other websites for those who are interested in exploring more about these world altering historic topics. 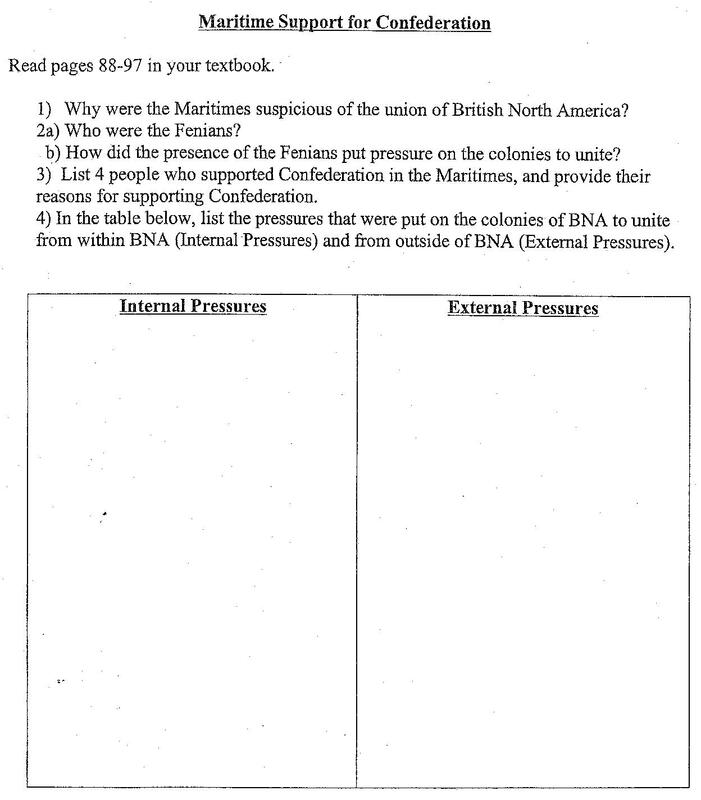 (A) In order for grade 8 students to understand the reasons that politicians had for initiating discussions about a union of the colonies of BNA, they must first have some background information about what was occuring in the USA in the mid 1800's. Much of the talk of creating a union started with the commonly held belief (at the time) in Manifest Destiny (http://bit.ly/a3qBoS). Many Canadians felt that an American attack was imminent, and the Civil War did alot to enhance those fears. For the subsequent lessons, the following weblink may be helpful in understanding the desire of the independent colonies to unite into a Confederation. The American Civil War played a major role in the fears citizens of British North America felt in the mid 1860's. Rumblings of the necessity of unitying began in earnest amongst politicians within each of the colonies at this time. On the other hand, many citizens feared that there was simply too much regionalism to really consider creating a country out of such independent colonies. However, the push for Confederation was also necessitated by factors other than the those brought about by those initiated from the USA. England's support of the colonies of BNA was waning by the 1860's, and many British politicians wanted the colonies to become less reliant on "the mother country". As well, issues were arising within each of the colonies that required them to seek each other out in order to move forward (politically, financially and militarily). It was the combination of these internal and external factors that eventually led to the creation of a federal union of several of the BNA colonies. 2) The necessity of expanding the Intercolonial Railway from Canada West to Nova Scotia to allow for increased trade between the colonies. This notion came in light of the United States decision to revoke the Reciprocity (free trade) Agreement between the nations at the end of the Civil War. The Americans were angered that Britain provided both financial and military aid to the Southern (Rebel) States during the Civil War. This anger extended to BNA who were part of the British Empire. 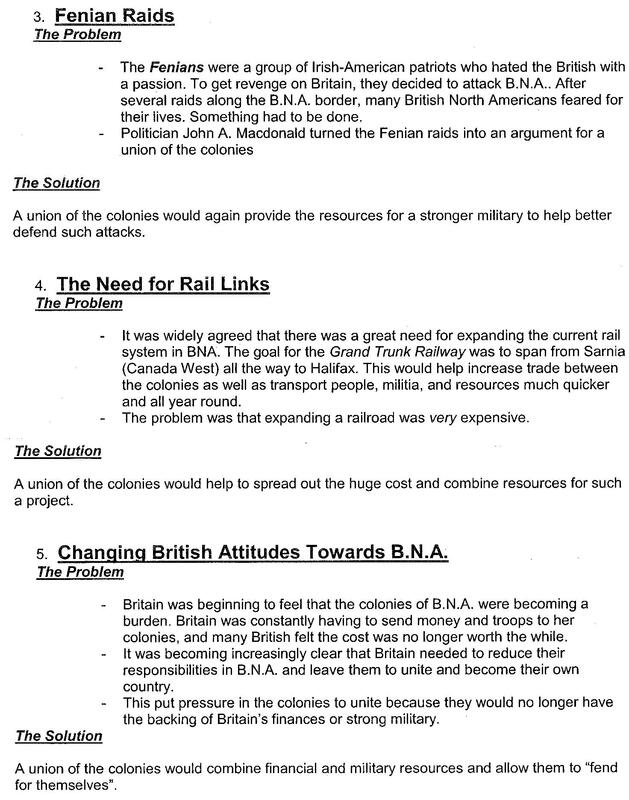 4) British politician's desire to reduce their role (financially and militarily) in governing BNA and their wish for the colonies to become more independent. The notion being that, if united, the colonies would be able to share expenditures and militaries instead of relying so much on Britain. 5) The Fenian Raids of towns bordering the USA and BNA. These were lead by a group of Irish expatriots (many whom had fought during the American Civil War). They hoped to win independence for Irish citizens by capturing BNA. Watch the following humorous clip to learn how little the average Canadian citizen knows about Confederation and George Brown - who played an instrumental role in negotiating the terms that lead to the creation of the Dominion of Canada. The following clip provides a brief synopsis of the Fenian attempts at capturing Canada. I apologize in advance for the spelling errors during the clip. It was produced by a student, but the information is fine. Many of the citizens within the BNA colonies were not excited about the talk of a Confederation. For some, the idea of change (separating from Britain) was not acceptable. In fact, many Maritime citizens feared their political voice would not be heard against the larger colonies of Canada West and Canada East. For others, the ongoing issues between the French and English in "the Canadas" was cause for concern. Still others worried about the debt that would be incurred from trying to build a railway across such a large expanse of land. There was even some sentiment toward "the Canadas" uniting with the USA. These colonies shared a border with the USA, and the American markets were closer in terms of trade partnerships than the considerable distance to the Maritimes. There was also a concern about trying to defend such a long unprotected border. 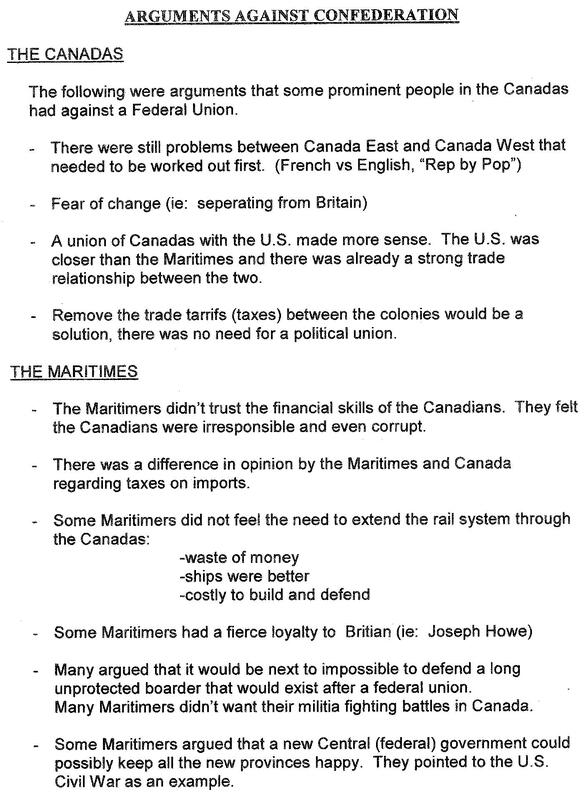 Today the students examined the arguements against Confederation. 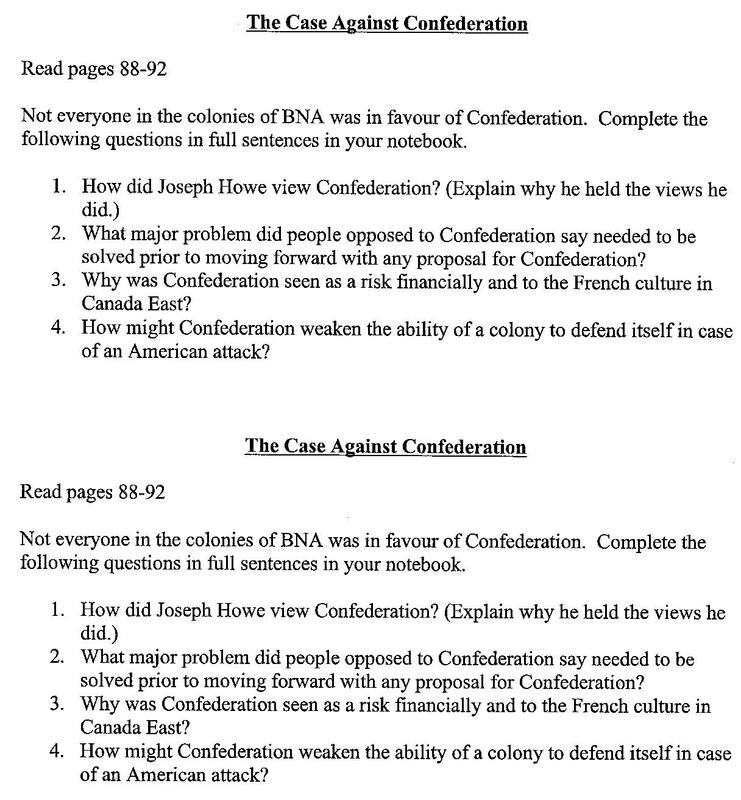 They were asked to complete a series of questions that looked at the case against Confederation. 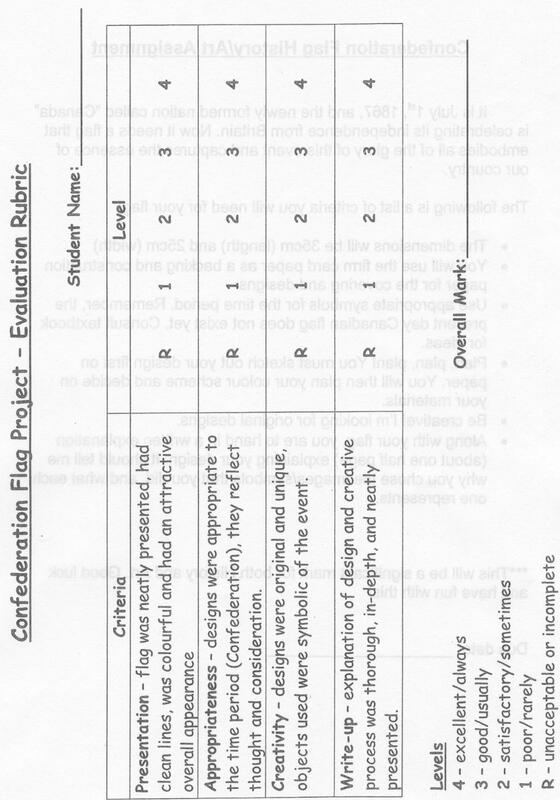 They also received a sheet that summarized the arguments against Confedration. Negotiations between the colonies began in earnest in September of 1864 when the 4 Maritime colonies decided to meet in Charlottetown to discuss a possible union. Delegates from Canada East and West caught wind of this meeting and decided to join in without being invited. 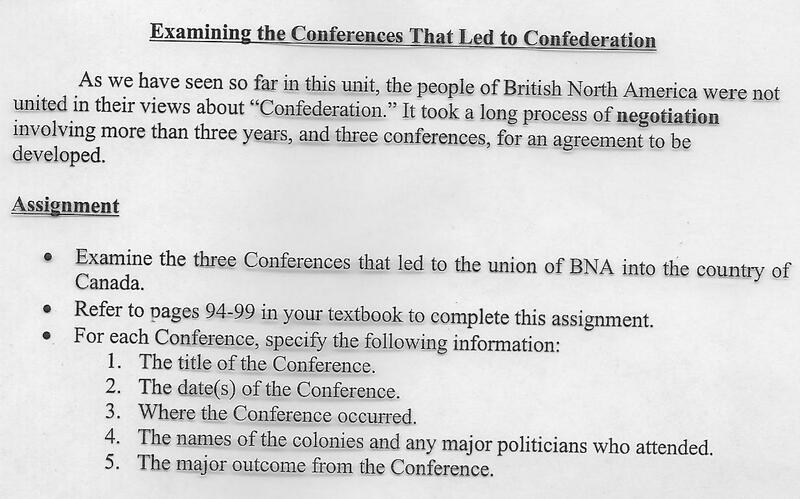 For 17 days politicians representing the various BNA colonies discussed the pros and cons of forming a Confederation. These initial talks led to a decision to meet again in Quebec City (1864) and then later in London, England (1866). 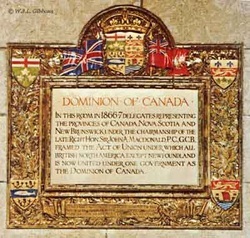 From these meetings, a constitution (laws of how to govern a country) were hammered out (called the BNA Act) and four of the colonies decided to unite to form a country called "The Dominion of Canada". Once the BNA was officially signed, it was time to select a leader to govern the new country. By definition a leader is a person who influences a group of people towards the achievement of a goal. There were many candidates from the Fathers of Confederation who were capable of fulfilling this role. However, one candidate seemed determined to lead the new country from it's infancy. 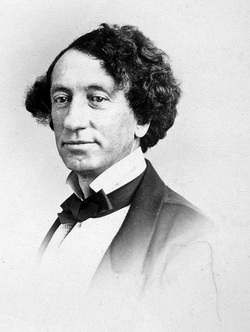 John A. MacDonald was the most vocal of the candidates and clearly had been visiable throughout the entire negotiation process that lead to Confederation. One of the biggest tasks of the new leader was to outline the powers that each level of government would be in control of. This was not an easy task as there was a lot of regional interests that needed to be addressed. Finally, after much debate the division of authority for various political decisions was finalized. Today students were asked to describe the qualties that made John A. MacDonald the right choice for our first Prime Minister. They were also expected to examine the division of power between the three levels of government that still exist today. The following clips provide some background information on John A. MacDonald. There is numerous other documentary videos available on Youtube if you are interested. Enjoy. 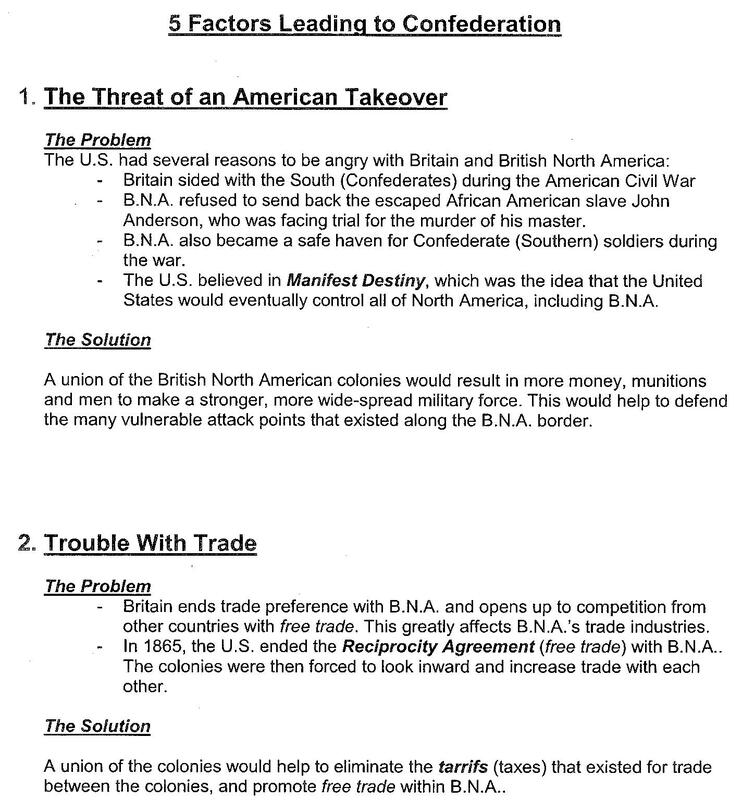 The British North America Act (BNA Act) did not make Canada completely independent of Britain. 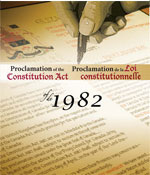 Canada did not become completely independent until 1982, when the "Constitution Act" was passed. This was an important document because it officially ended Britain's authority over Canada a full 100 years after Confederation was first signed. Until the Constitution Act was initiated, the highest court of appeal for government decisions was in Britain. Therefore, important decisions like whether Canada would go to war or not, was ultimately decided by the English government. This is why Canada joined WWI and WWII at the onset of those wars. Once England joined, Canada had to comply. After the Constitution Act was signed, all major decision involving Canada were made in Canada. This is evidenced by Canada's decision to not become involved in the invasion of Iraq in 2001 (although the U.S.A. and England did). Today the unit on Confederation was completed. The students are to now prepare for next Tuesday's test. A copy of the major concepts to study was provided to each of the students. I have attached a copy of the review in case the students misplace their copy. 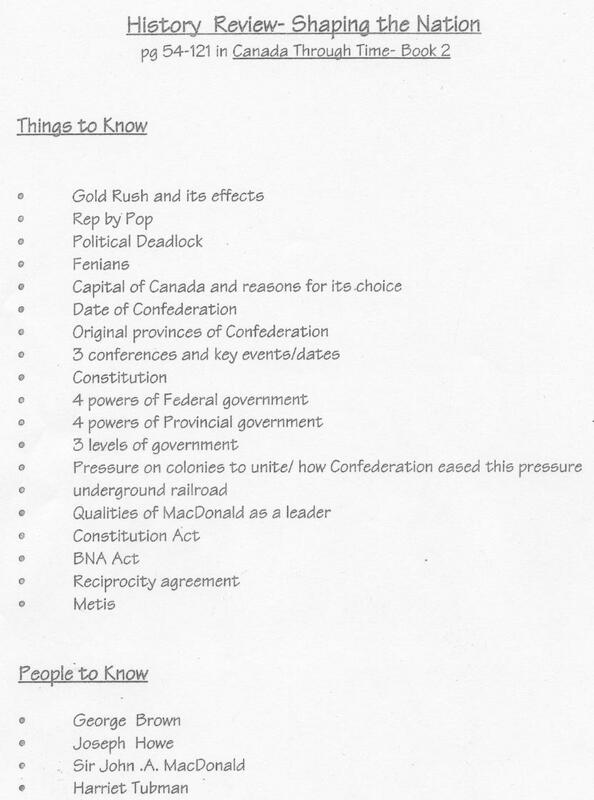 To finish off the unit on Confederation, the students will complete 1 of 4 possible assignments about the concepts we have covered this unit. 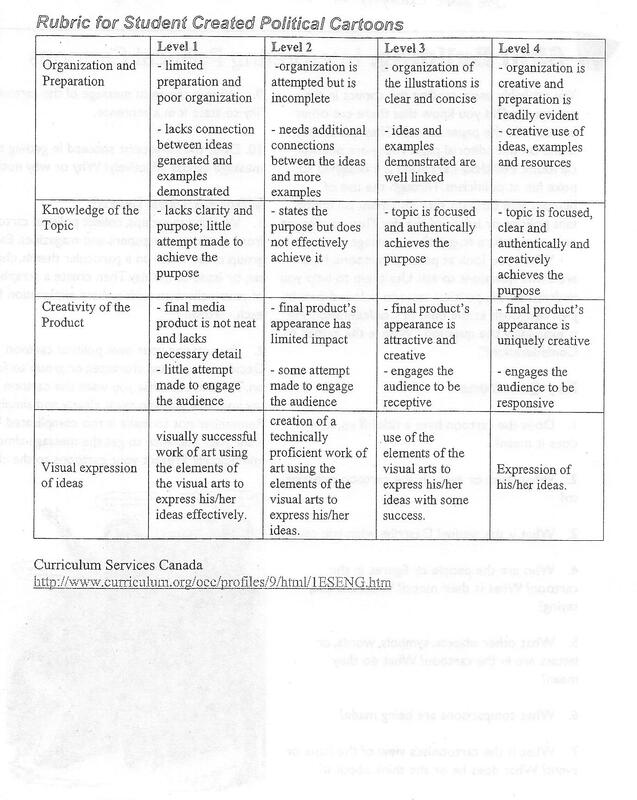 An outline of the assignment is included in the list of files below. 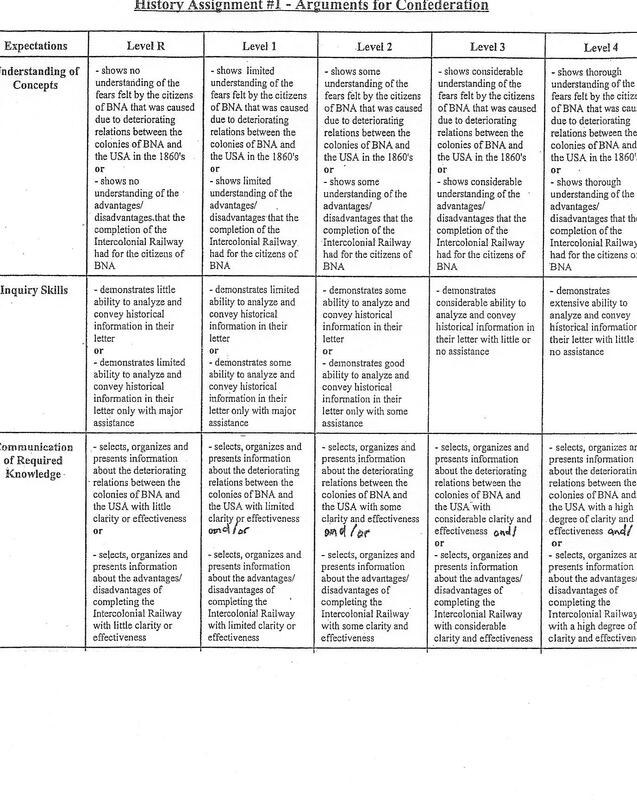 I have also included the individual assignments and rubrics for each as well. 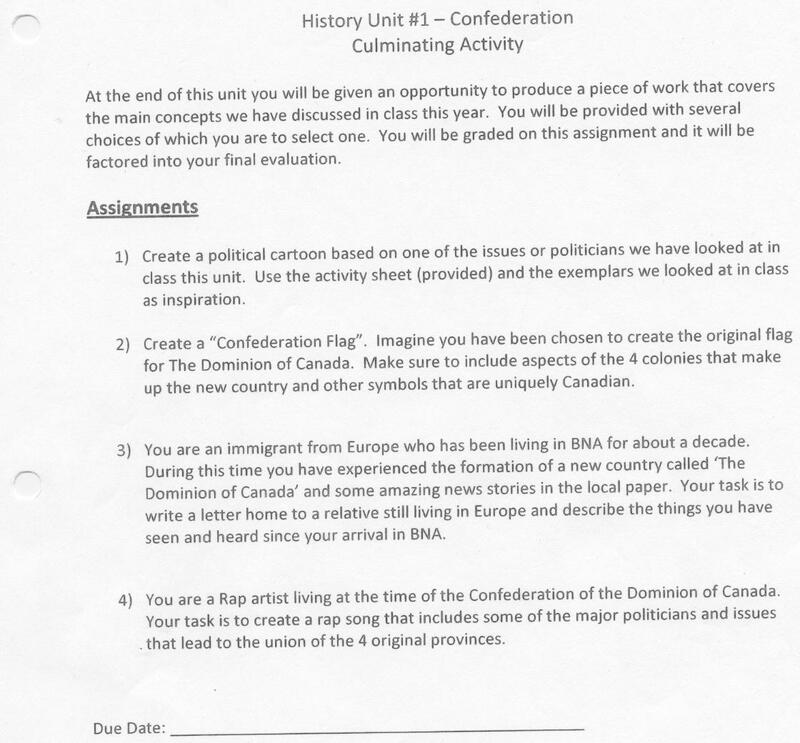 The video at the end shows an example of a song about Confederation that the students can use as a model if they decide to try this option.